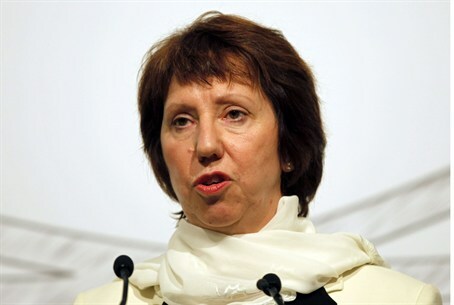 EU foreign affairs head Catherine Ashton calls for "bold decisions" in the Israel-PA peace process. EU foreign affairs head Catherine Ashton will chair a meeting of top international officials working on the Israel-Palestinian Authority (PA) peace process on Saturday, AFP reports. "This meeting takes place in a moment when difficult and bold decisions need to be made," Ashton said in a statement Friday quoted by the news agency. Ashton said she will be joined Saturday on the sidelines of the Munich Security Conference by UN Secretary General Ban Ki-moon, U.S. Secretary of State John Kerry, Russian Foreign Minister Sergei Lavrov and former British prime minister Tony Blair, envoy for the so-called Quartet which includes the EU in addition to the UN, U.S. and Russia. "The dividends of peace for Israelis and Palestinians are enormous," she said, according to AFP. "I hope that together we can help those (bold) decisions to become a reality to continue working towards a negotiated peace agreement, setting an end to the conflict and fulfilling the legitimate aspirations of both parties," added Ashton. Kerry has been leading a new push for a Middle East peace since July, and he is reportedly set to present the sides with a framework for the continuation of talks. On Wednesday, Kerry’s plan for peace was outlined by Thomas Friedman in the New York Times. According to Friedman, Kerry’s plan will call for a phased Israeli withdrawal from Judea and Samaria based on the 1949 lines, with "unprecedented" security arrangements in the strategic Jordan Valley. The Israeli withdrawal will not include certain settlement blocs, but Israel will compensate the Arab side for this with Israeli territory. The deal will call for “Palestine” to have a capital in Arab eastern Jerusalem and to recognize Israel as the nation state of the Jewish people. On Thursday, American Jewish leaders who were briefed by envoy Martin Indyk said Kerry’s framework mentions a Palestinian state with borders based on the 1949 Armistice lines and with land swaps between Israel and the PA. 75 to 80 percent of the Jewish residents of Judea and Samaria would remain in their homes even after a permanent agreement. The agreement will include a reference to the PA’s incitement against Israel and will also include a reference to compensation for Jewish refugees who came from Arab countries. The Arabs would recognize Israel as a Jewish state, Israel would recognize the Palestinian state, and the two sides will announce the end of the conflict. Blair was in Israel on Thursday and met with President Shimon Peres, who called for “historic decisions” when it comes to the peace process.